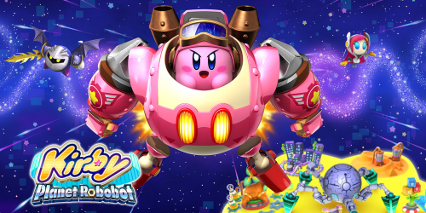 Kirby: Planet Robobot is exactly what you’d expect from a Nintendo platformer and exactly what you’d expect from a Kirby game at that. It’s highly polished, fun, takes a new slant on a very tried and tested set of mechanics, and like many new iterations of long-standing series it feels a little out of place. It is very good in a lot of ways but when it comes down to the nitty gritty it’s not going to change the minds of anyone who isn’t already a fan and it doesn’t reach the heights of previous games either. 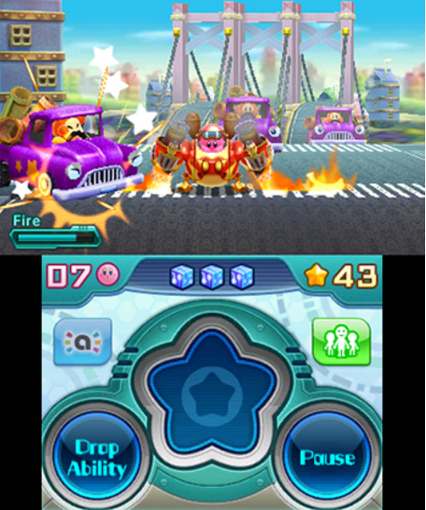 Planet Robobot begins with an alien craft landing on Kirby’s world and beginning what can only be described as hostile terraforming. Not content with simply industrialising the world with their technological terraforming, they also take inhabitants and (presumably) forcefully “enhance” them in a way similar to the Borg but without the ability to then infect others. Kirby unsurprisingly takes on this cybernetic threat by consuming all those that get between him and Dream Land’s freedom from the mechanised menace. The Devourer has his usual bag of tricks; the power of flight, the ability to copy the abilities of those he swallows, roundness, and a cheerful demeanour. He also can now inhabit a Mech Suit; or “Robobot” if you prefer. From these he gains the strength to move objects of great weight, smash obstacles as if they were flies being swatted by his mighty robot arms, and he also can scan and deconstruct enemies and assimilate their powers into this body of steel. When it comes to interesting level design this has it in spades. Not only is each area based on a theme which is well explored over multiple levels, but each hides interestingly accessed secrets and easily-stumbled-upon puzzles. Both of which harbour either the coveted Code Cubes that open up each area’s boss or extra levels, or one of the many stickers that are there to be collected and then forgotten about. It’s quite delightful to figure out these puzzles or finding that last Cube’s hidey-hole, but the same delight is not shared in finding Stickers once you’ve gotten a few and realise that they’re more pointless than a complete Pokédex (this is hyperbole, a complete Pokédex is bloody good indeed). Stickers can only be placed on the arms of your Robobot, yet manage to be not all that noticeable in motion nor even on the 3DS screen in general. Powers though, of which there are plenty, make up the core of our insatiable hero. Not only are there many to choose from, they are also there to be had at almost any moment thanks to Amiibo functionality. This is a great feature… if you have a New 3DS or an NFC reader, and it thankfully doesn’t hamper the experience if you have neither. It’s a pity that certain puzzles required a different power to the ones we opted to take, but it also means greater use of less powerful ones and finding some unique traits that we wouldn’t have expected beforehand, such as Beam sharing the electric properties of the Spark powers. What does hamper the powers though is the lack of them for the Robobot and the lack of options for some of them. Of the many powers available, less than half can be given to the Robobot which means you’ll never see a poison-spewing or Ninja mech which, other than being invariably cool, also means that mech time ends up feeling a little samey until a few sporadic levels really push home some interesting ideas. On the less metallic side of powers, certain ones feel much more fleshed out as they either have a far larger repertoire of moves, or just have more varied uses. The use of the mech and its limited power set makes it feel very much like the first half of Super Mario 3D Land, except this time there isn’t a second round with more interesting Luigi levels; instead of power variations you get five vaguely interesting distractions. Two of which only are accessible once you’ve finished the game, with a third requiring you to more or less complete the game twice. 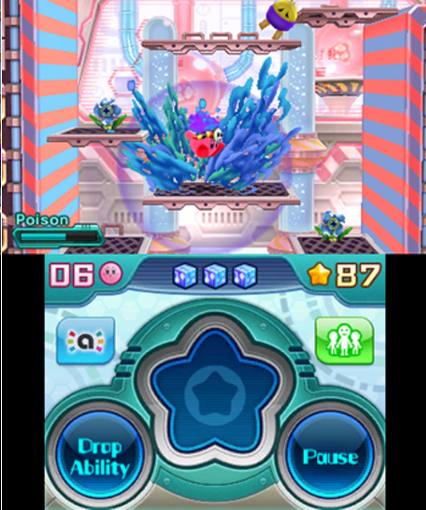 Kirby 3D rumble is a set of three 3D levels which take place in small 3D arenas, where you have to collect coins and kill enemies in as little time as possible while maxing out a combo multiplier at the same time. It’s entertaining enough but it’s over before it really starts. 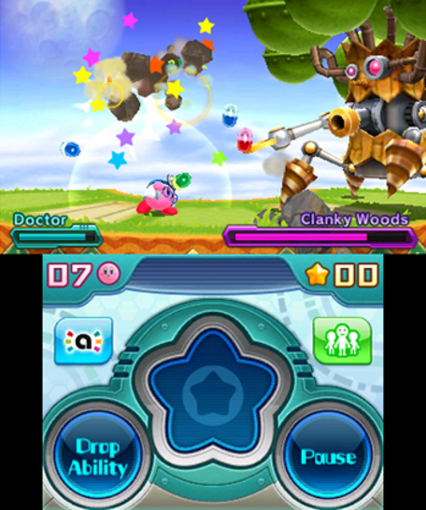 Team Kirby Clash is a basic light-RPG with four Kirby classes to choose from: Healer, Swordsman (dps), Hammer (tank), and Beam (slightly ranged dps). It’s a 2.5D battle against Bosses that don’t appear anywhere else. This one has quite a few levels, though they don’t last that long and you’ll be done with it quickly even if you don’t play it with friends. While we won’t spoil the last mode, The Arena is a Boss Rush mode and Meta Knightmare Returns is all the levels from the Story mode smooshed together with checkpoints and Metaknight. Meta Knightmare isn’t awful but the levels have very little change in them so it just ends up being a slightly easier Story mode up until the last boss. Planet Robobot is fun enough in itself, but it doesn’t make enough use of these ideas to really feel that fleshed out. It doesn’t help that the throwaway modes just feel like they took energy away from adding more levels or anything else that’d make the main game feel more substantial. It’s still fun enough in the moment, but overall it smacks of unexplored ideas and a lack of challenge.